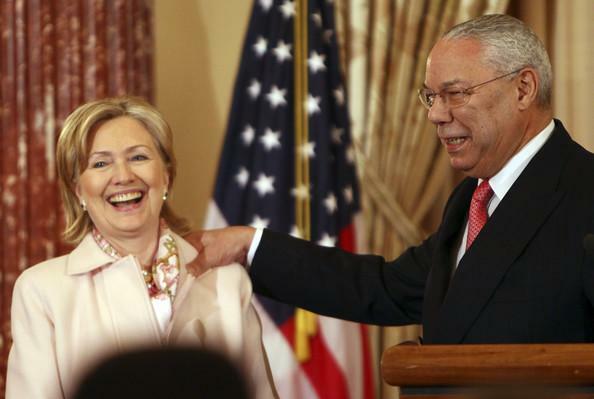 Former Secretary of State Gen. Colin Powell defended current Secretary of State Hillary Clinton's handling of the attack on the U.S. Consulate in Benghazi, Libya, saying it could've happened under anyone's watch. "I think she's had a distinguished record," Powell said in an interview on NBC's "Meet The Press" broadcast Sunday. "And I don't think that this one incident--which is one of these things that those of us in government have been through many, many times where suddenly an action happens late at night ... I don't think it's a blot on her record." "You're surprised," Powell said of the Sept. 11, 2o12, attack that killed four Americans, including U.S. Ambassador Chris Stevens. "Somebody gets killed, something gets blown up. And then the after-action reports start and everybody wants to know who was at fault. Who was responsible? 'Why didn't you keep this from happening?' Well, you can't keep everything from happening. Benghazi was a very, very difficult one and a difficult situation, and maybe they shouldn't have been there in the first place." Earlier, Powell was asked for his assessment on Chuck Hagel, President Barack Obama's nominee for defense secretary. "This is a guy who knows veterans, knows the troops," Powell said. "And when people say, 'Well, that doesn't necessarily make him a good candidate for secretary of defense,' I'll tell you who thinks that makes him a good candidate for secretary of defense: The men and women in the armed forces of the United States and their parents, who know that this is a guy who will be very careful about putting their lives at risk, 'cause he put his life at risk." Powell continued: "He knows what war is, and he will fight a war if it's necessary. But he's a guy who will do it with great deliberation and care. … He is a fellow he speaks his mind. He sometimes gets in trouble with those who thinks he should not speak his mind, but he says what he believes and he sticks with it." The retired general said Hagel--who was criticized for past comments about Israel--"will be on Israel's side." Powell, who served as secretary of state during President George W. Bush's first term, also gave a frank assessment of the GOP. "I think the Republican Party right now is having an identity problem, and I'm still a Republican," Powell said. "But in recent years, there's been a significant shift to the right, and we have seen what that shift has produced: two losing presidential campaigns. I think what the Republican Party needs to do now is take a very hard look at itself and understand that the country has changed. The country is changing demographically. And if the Republican Party does not change along with that demographic, they're going to be in trouble. "There's also a dark vein of intolerance in some parts of the party," he added. "Everybody wants to talk about, 'Who's going to be the candidate?' You've got to think first about, 'What's the party actually going to represent?' If it's just going to represent the far right wing of the political spectrum, I think the party is in difficulty."